As I sat across from one of my prior students this summer and listened to his story, I was struck by how young he was and yet how old and tired his eyes were. As he shared the events of the past few years, I understood the weariness. His story was familiar and yet freshly painful. He lived for years hiding his real identity. He always felt out of place and on guard. He finally embraced who he was only to be pushed away by the people he loved the most. Now he is in a period of recovery and growth. He is surrounded by new friends and systems of support that keep him going. He is holding his own for now but knows that tomorrow might bring harassment or even harm to him and his friends. One of the most important lessons from the Holocaust is that silence is dangerous. I resolve to be silent on this issue no longer. After our conversation, I happened to be preparing for my upcoming Holocaust course and decided to further investigate Hitler’s treatment of homosexuals. I knew that this group was targeted by the Nazi government but, honestly, was not familiar with many of the details. Here is a short summary of what I discovered: There was already a law in Germany making homosexual activity illegal under Paragraph 175 of the criminal code. Hitler exploited and expanded this law in order to arrest as many people as possible. The “criminally indecent” who fell under this law were driven into hiding to escape arrest. They lost their network of friends and critical social support. They were isolated and alone. Hitler believed that homosexuals could be “cured” through beatings, arduous labor, and humiliation. According to many survivor accounts, homosexuals received some of the worst abuse in the camps. After processing this new information, I made a decision. 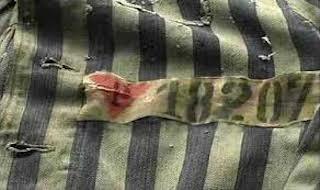 I will incorporate a meaningful treatment of this topic into my Holocaust teaching this year. Using personal testimonies from iWitness, materials from Facing History and Ourselves, and resources from the USHMM, I created a unit that will present the information about the Nazi treatment of homosexuals and affirm students who are wrestling with their sexual or gender identities. I plan to make it very clear to my classes that I will always stand up for those who identify as LGBTQ, no exceptions, no matter where I am. In this way I will send the message to students in my class who might be struggling with issues related to sexual or gender identity that I am there for them, whatever they may need. One of the most important lessons from the Holocaust is that silence is dangerous. I resolve to be silent on this issue no longer.